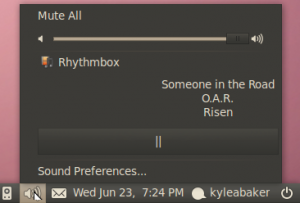 If you’re anxiously awaiting the release of Ubuntu 10.10, then you may know that the volume indicator applet is set to receive some nice improvements. While it is not yet completed, I’ve taken some screenshots to point out some flaws and the way I think it should look and feel below. Songs with long filenames cause for wide menus. Shorter song titles fit a bit better. This is how I think it should end up looking. 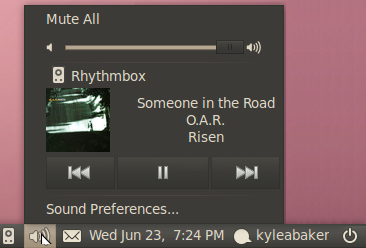 It’s certainly coming along nicely and I think this will be a well received update in Ubuntu! There are plenty of other improvements coming to Ubuntu 10.10, but improvements like these are the ones that are making me quickly become an Ubuntu only user!